5 years ago almost to the day, Costanza and I ventured down to Seattle for the madness known as Black Friday. Some called us brave, some swore we were crazy while others knew why I was really there - for the food! 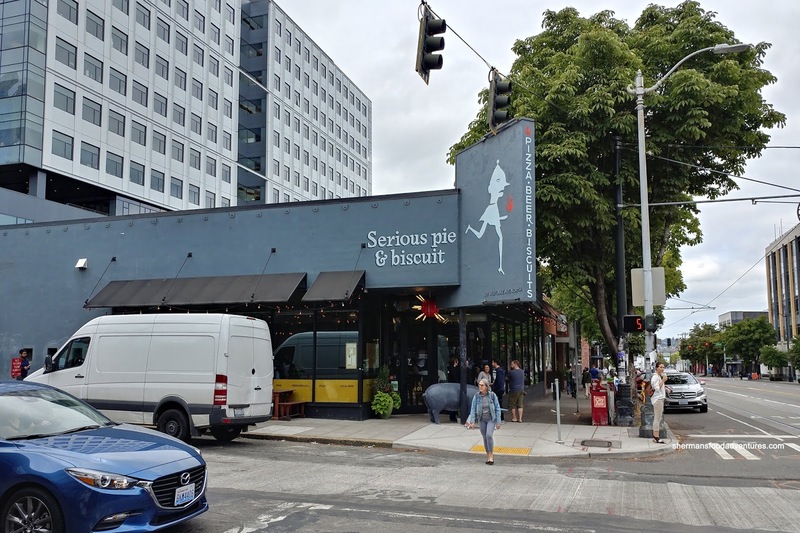 After some serious all-night shopping and very little sleep, we still made it out to Downtown Seattle to check out one of Tom Douglas' many delicious eateries - Serious Pie (see how I used serious in the sentence as foreshadowing?). We came away impressed and wanting for more. Costanza wanted to return right away, but heck, who does that when there are so many choices! This time around, we returned with both families and we ended up checking out their other location that also features biscuits. 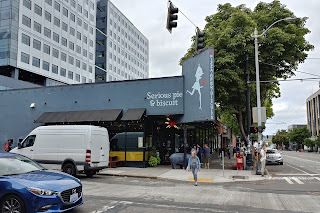 About that biscuit, we had to get an obligatory one to check it out right? 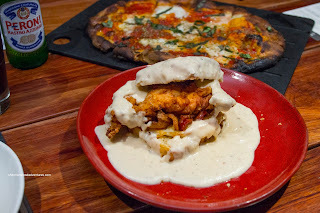 We ended up with the "Zach" sporting fried chicken, tobasco black pepper gravy, fried egg and bacon. Eerily similar to the "Reggie" from Pine State Biscuits, this one ate heavy and sinfully. Loved the gravy as it was peppery and creamy. The fried chicken was fairly moist with a lightly crispy coating. Egg was runny and bacon was crisp while the biscuit itself was exhibited a crunchy exterior giving way to firm fluffiness. Solid biscuit. For our first pizza, we chose the basic with 2 of the Buffalo Mozzarella, tomato sauce and basil. 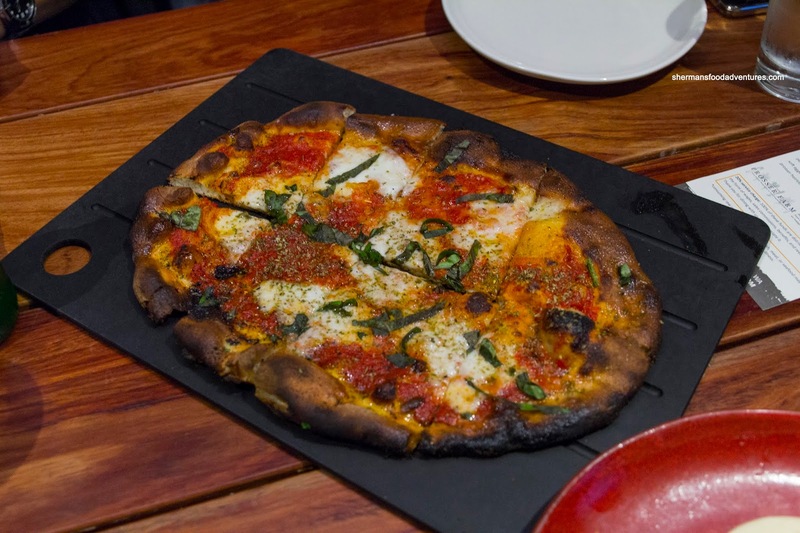 Clearly evidenced by the picture, the crust was heavily charred, thin and crunchy. Yes, there was a strong nuttiness going on to compliment the tangy tomato sauce and ample basil. My personal favourite was the Sweet Fennel Sausage, roasted peppers and provolone. This was super zesty and meaty from the combination of tender sausage and sweet peppers. Add in the tangy tomato sauce as well as the well-charred crust, this was a textural and taste delight. Moreover, I actually liked how this one was less burnt. The first one was probably just a bit too much so. I'm not always a fan of raw arugula on top of pizza because it seems to fall off and doesn't really do anything. I guess it was the same for the Soft Eggs, prosciutto and local greens. Whatever the case, the runny eggs and the salty prosciutto were a nice combo in a breakfast sort-of-way. This crust was actually not charred enough for my liking though. Our last pizza was the Roasted Seasonal Mushrooms and truffle cheese. 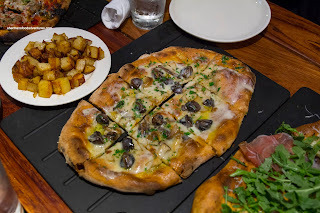 Naturally, this one was aromatic from the truffle and woodsy from the mushrooms. Another classic combination that wasn't overpowering. 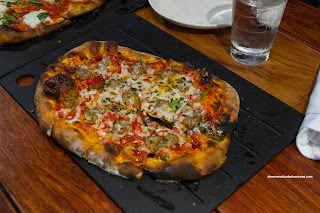 I liked this one almost as much as the fennel sausage except the crust was barely charred. On the side, we got 2 orders of the Bacon Fat Home Fries. OMG, these were rich and super potent. The kids googled these morsels up and we barely had a sniff. They don't look like much, but they were yum! 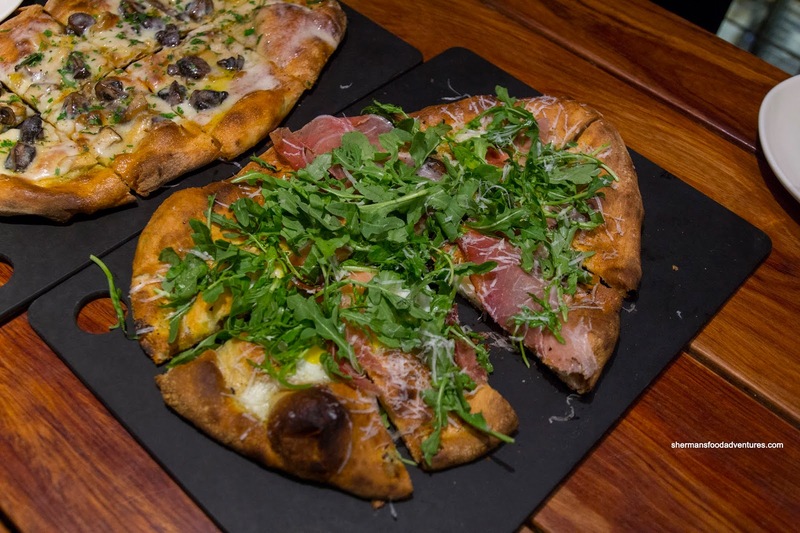 Once again, Serious Pie didn't disappoint as their crust is what makes their pizza. Just wished it was a bit more consistent.